(a) Measure the valve opening pressure. (1) If there are water stains or foreign matter on rubber packings 1, 2 or 3, clean the part(s) with water and finger scouring. (2) Check that rubber packings 1, 2 and 3 are not deformed, cracked or swollen. (3) Check that 3 and 4 are not stuck together. 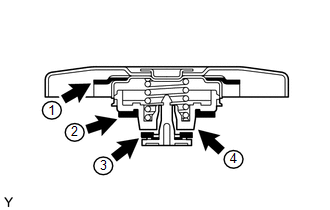 (4) Apply engine coolant to rubber packings 2 and 3 before using the radiator cap tester. 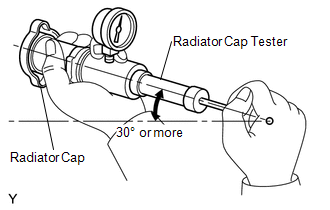 (5) When using the cap tester, tilt it to 30° or more above level. (6) Pump the cap tester several times, and check the maximum pressure*. *: Even if the cap cannot maintain the maximum pressure, it is not a defect. If the measured maximum pressure is less than the minimum standard value, replace the radiator cap sub-assembly.